The poems are accessible but never trivial: warm, earthy, intelligent and – just when you begin to snuggle into the intimacy of it – spiked with fire and venom. "wormwood, earth and honey" may be purchased directly from Circaidy Gregory Press here or by contacting the author. A cacophony of selected emotions mischievously and deviously mixed to excite, scare, amuse and perplex. Succeeds on every page to play and tease with the mind and the funny-bone. This offering by Catherine Edmunds is bound to be one of the classics from this stable. Buy a copy or go ‘hoodied’ to your public library and borrow it, don’t let it be known that you don’t OWN a copy! I don’t usually read poetry but, getting to know ‘delph-ambi’ from the Earlyworks Press Writers Forum (and having the good fortune to meet Catherine in the flesh last year), I wanted to read her new book of poems, ‘wormwood, earth and honey’. By doing so, I was introduced to a whole new, colourful world of words. Although Catherine and I have gender, painting and writing in common, we approach the latter from completely different viewpoints, and I’ve always been tremendously grateful for her unbiased, concise and helpful remarks when commenting on my writing when posted on the forum. This is poetry for a rainy day; to cheer you with colour, make you realise ‘clouds dropped lumps of water’ on everybody at some time, or giggle at the wry humour. A lovely selection of poems and highly recommended reading. 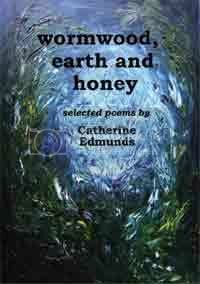 Catherine Edmunds’ new book of verse ‘wormwood, earth and honey,’ recently released by, and available directly from, Circaidy Gregory Press, http://circaidygregory.co.uk/poetry.htm , and also from Amazon, could not have got off to a better start for me. The cover art, her own creation, is my kind of art: bold brush strokes, visual texture and rich colours. In fact, the cover art has an almost ethereal marine feel to it. Catherine is no superficial poet awash with jolly statements that cannot possibly be misinterpreted. She is a thinker’s poet, a writer whose words very often conceal and beguile, and whose meanings frequently wear the camouflage of allegory and metaphor. If you want the most from her poetry, you will have to think about it. This is not a book for skimming during a free moment in the lavatory. Even her humour requires careful attention. She is a compelling storyteller, weaving complex and sometimes lyrical tales with surprisingly few words. There’s no waste with this poet. Every word, every line break, every nuance is calculated for maximum effect. The lady handles drama, sentiment, nonsense and humour with equal aplomb. Catherine is what every seriously talented poet must be: a gimlet-eyed observer. She is also versatile. Not content with just the contemporary style of free verse, she is equally at home with the sonnet (a particular favourite of mine,) haiku/senryu and a plethora of other styles and fancies. Pernickety paragons of punctuation will be disappointed. There isn’t a lot of it. For me, though, the lack of it gives Catherine’s work a sense of immediacy and sometimes restlessness that I like very much indeed. To sum up: this delightfully complex volume of poetry will please any reader who likes to take their time, ponder a lot and gaze at the heavens, but someone who also has a sense of the ridiculous. If I had one regret it would be that Catherine didn’t see fit to sprinkle a number of her wonderful drawings throughout the book. I give this book my Supreme Golden Syrup Pudding Award… I read it twice before lunch, and now I’m off back for thirds. Here is a review by Janet Murch, editor of iota and Ragged Raven (you have to scroll down a bit). An amazon review from aliqot. Often starting from an everyday object or experience, these poems may turn playfully surreal or dangerous and dark. From formal sonnet and sestina to free verse, her use of language is subtle and skilful. I find more in them with each reading. I shall dip into the book often. In this collection Catherine Edmunds addresses the immediate and the domestic. Ordinary things such as curtains, prunes, a father’s pipe, the crescent moon and a station waiting room all find their place here. Her poetry invests such things with mystery and surprising meaning. She goes on to entertain us with the surreal glories of a president’s hat only to brings us savagely to attention with the tragedy of a wife, third in line, who dies of starvation. In these poems word builds upon word in a lapidary fashion, showing us a world view essentially focused on family life and the natural world. The poet then proceeds to illuminate this world with an everyday kind of magic shot through with an acute recognition of the dark side of things. The tragedy implicit in the superficially jaunty poem Snake stayed with me for days. "wormwood, earth and honey" was voted May 2008 Book Cover of the month on Erin Aislinn's site here.